Something strange is happening on Sunny Island! Crops are popping up everywhere and growing out of control! If something isn't done soon, the once-tranquil island will be buried in an avalanche of vegetables! It's up to you to solve the mystery of this produce predicament as you try to tame the crops and gather as many vegetables as you can! 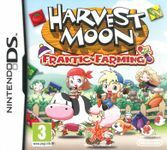 * Set in the world of the recent DS hit Harvest Moon: Island of Happiness! * Continues the tale of the island and its residents with 12 playable characters, each with their own unique story! * A variety of modes including Story Mode, the brain-teasing Mission Mode, and the action excitement of Score Attack Mode! * Unlock character art, music, and some special surprises in your Collection Room! * Test your farming skills as you play with or against your family and friends in Multiplayer Mode!